Combat Vet With PTSD Booted From Army, Barred From Healthcare SALEM, Ore. – In Salem, a former Army staff sergeant named Jarrid Starks has run out of the medications that keep him stable. He has severe Post Traumatic Stress Disorder and other mental and physical wounds of war. But he’s currently not eligible for veterans’ health benefits that would include prescription refills. That’s because Starks was kicked out of the Army for bad behavior. He’s far from alone. Correspondent Austin Jenkins has this story in collaboration with the Seattle Times. 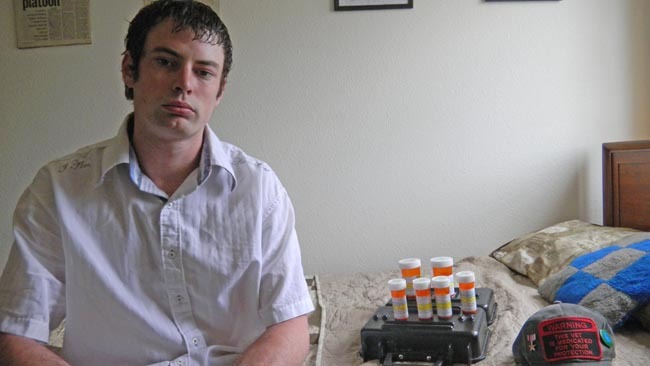 SALEM, Ore. – In Salem , a former Army staff sergeant named Jarrid Starks has run out of the medications that keep him stable. He has severe Post Traumatic Stress Disorder and other mental and physical wounds of war. But he’s currently not eligible for veterans’ health benefits that would include prescription refills. That’s because Starks was kicked out of the Army for bad behavior. He’s far from alone. Jarrid Starks joined the Army right out of high school with dreams of a 20-year career. He left the Army earlier this year in disgrace. Starks recalls being escorted from the psychiatric ward at Madigan Army Hospital to an out-processing center and then to the front gate of Washington’s Joint Base Lewis-McChord. “I had a 90-day supply of medication that I received from Madigan in a paper lunch sack,“ he says. That sack of pills was Stark’s lifeline: a combination of antidepressants, beta-blockers, anti-psychotics, muscle-relaxants and sleep aides. A daily cocktail that allowed Starks to keep his anger and anxiety in check. It’s a joke, but not really. “Ya, in every joke lay a bit of truth," Starks quips. On the day I met Starks, he still had 11 days worth of pills left. We sat in his bedroom in his father’s split-level house in Salem. He opened up a military-style waterproof container where he kept his medicines and lined up the orange bottles. I asked him what might happen when he ran out. If Starks was a typical veteran he’d sign up for VA benefits and get his prescription drug refills. But he doesn’t qualify for veteran’s health care -- at least for now. That’s because in May he was kicked out of the Army with an “other than honorable” discharge for drug use and going absent without leave. Starks says he did those things because when he came home from Afghanistan he was messed up. “Just the act of putting my uniform on in the morning would trigger flashbacks and would bring my anxiety and depression to a level that was just unbearable,” he says. He says he just simply could not face work. Even Army doctors concluded he was unfit for duty and should be medically retired. Starks says there were times he was so angry he might have even been capable of murder. I asked if he could have potentially killed himself. Starks was in and out of psychiatric hospitals three times. But his misconduct prompted the Army to take a hardline. Starks was jailed on base and charged with crimes related to his drug use and going AWOL. Rather than face court martial, Starks accepted a voluntary separation from the Army. In Afghanistan, he earned a Bronze Star with Valor. Back home Starks was handed an “other than honorable” discharge. “I’ve been stripped of all rank, I’ve been denied an honorable discharge and basically the Army has made repeated statements that they want nothing to do with me anymore,” he says. Officials at Lewis-McChord respond that Starks knew the risks when he voluntarily chose to separate from the Army to avoid court martial and possible conviction. According to Defense Department records, more than 20,000 soldiers and Marines were booted from the military between 2008 and 2011 with other than honorable discharges. Current federal law says these former service members -- even if they suffer from the mental or physical wounds of war -- lose their automatic right to veterans’ medical benefits. Kristin Cunningham is with the Veterans Health Administration in Washington, D.C.. She explains what happens if an “other than honorable” veteran shows up seeking care. Instead, the veteran is placed in a sort of healthcare limbo while the VA conducts a comprehensive review of the record -- including the misconduct. That can take months and there are no guarantees of care at the end of the process. The VA says it doesn’t track how many “other than honorable” veterans apply for these reviews or how many are ultimately awarded health coverage. But for the last several years these vets have found support from an unlikely source -- senior military lawyers. Major Evan Seamone is chief of military justice at Fort Benning, Georgia. He says, of course, it’s important to maintain good order and discipline in the ranks. Seamone isn’t the only military lawyer to raise this concern. In a 2010 law review article, Army Major Tiffany Chapman called on Congress to change federal law to ensure that soldiers with PTSD get treatment regardless of the circumstances under which they were discharged. Back in Salem, Jarrid Starks has applied to a review of his case, but his county Veteran’s Services rep recently advised him that a decision will likely take a year or more. That’s a heck of a long time for someone dealing with multiple flashbacks everyday. Starks visibly shakes as he tells me about his worst day in Afghanistan. His 25th birthday. His close friend was killed in a bomb blast. The alleged triggerman escaped on a motorcycle with an eight-year-old boy on the back. Starks shot and killed them both. Starks’ father Lonnie -- a retired Navy man -- says his son came home from Afghanistan broken. For now, Jarrid Starks plans to start taking classes at his local community college. It’s one way he hopes to stay out of jail or a psychiatric hospital. This story was produced in collaboration with the Seattle Times.